It is late summer, perfectly clear and warm on the coast, and we head to Pescadero, 17 miles south of Half Moon Bay, 34 miles north of Santa Cruz . Each autumn we drive to Phipps Country Store, several miles up the road from Pescadero, to buy the new harvest of unusual beans. But today we are looking for lunch in this tiny 2 block coastal town (population 643 in 2010). On the main street we find a 117 year old tavern designated as an “American Classic” by the James Beard Foundation, a general store recently remodeled to include wood-burning oven and a striking modern blue glass bar, a New England style church built by Yankee settlers in 1867 and a wooden statue of a goat and girl pointing down a country lane. We follow the point down North Street for about a mile and arrive at Harley Farms Goat Dairy. Signs (they are very good with signs at Harley Farms) designate the milking shed and welcome us to the pastures where we spot a doe, udder heavy with milk, trying to evade the single-minded advances and grunts of an imposing buck. Leaving them to their adventure we follow the sign to the Goat Shop. Adrianna greats us and answers questions as we sample cheeses around the shop. 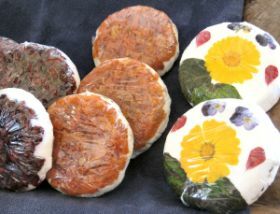 We start inventing occasions for using these beautifully hand crafted cheese. The ricotta is exceptionally fresh and sweet… perhaps wild mushroom lasagna? There is goat feta to match the heritage tomatoes in every store now. A selection of topped and flavored chevres could begin a dinner we have planned later in the week. 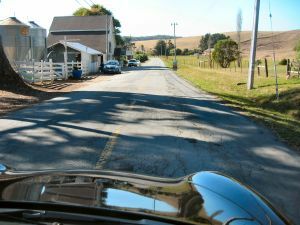 The shop has been open about 7 years, although this dairy has been in operation 20 in a restored dairy farm from 1910. A long timeframe is not unusual for Pescadero, we learn. Our lunch is in Duarte’s Tavern, a fourth-generation-run establishment opened in 1894. The menu is based on vegetables from the valley and locally caught fish, so the specials reflect seasonal availability. 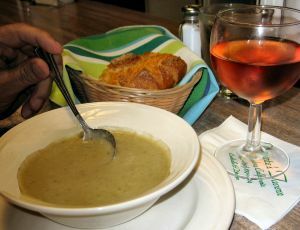 We sit at the lunch counter and order the house specialties: artichoke soup and olallieberry pie, pleased that we have found Duarte’s. The dining room is simple and welcoming. The adjoining aged wood bar is where great-granddad Frank started the business by selling shots from a whiskey barrel brought up from Santa Cruz. The original land grant for this fertile valley was given by Mission Santa Cruz in 1833. By the 1860s Pescadero was a thriving farming and lumber town. In 1853 the sailing ship Carrier Pigeon wrecked on the rocky coast nearby. A stage coach was salvaged and used by Wells Fargo Co. for the next forty years, bringing freight and passengers to the coastal town. A few of the 19th century homes on Stage Road, the main drag, still sport their traditional white paint, another bounty claimed from a 19th century ship wreck. If you are in town for only one meal it is hard to choose. The Pescadero Country Store has re-invented itself since I was last here with stylish indoor and outdoor seating, wood burning oven featuring regional products and a great looking bar. They serve beef from the local company Leftcoast Grassfed. There is also a touted taqueria in a gas station, the Thursday afternoon certified local farmers market and a fine food and wine shop for assembling picnics on the beach. 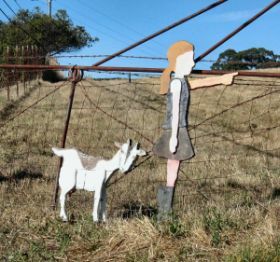 And don’t leave town without visiting the quirky Phipps Country Store a mile or two up Pescadero Creek Road (see the article https://acooksca.com/2009/04/02/the-bean-of-the-decade/ .) The farm-grown gigante beans are, for me, worth the drive.